Doe Paoro describes her music as “ghost soul,” due in part to her haunting vocals and the lingering chants that fill her songs. Doe Paoro is actually Sonia Kreitzer, a New York state native who wears the mythical façade after an unforgettable trip through the Himalayas. It was in the southern Asian mountains that Kreitzer discovered “Lhamo,” a Tibetan opera style characterized by songs and dance of the region. 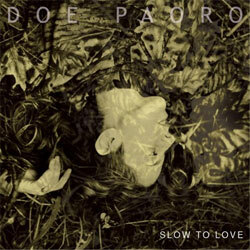 With a unique vocal delivery and heavy spiritual elements, Doe Paoro stands out from her Brooklyn peers by truly stepping away from the average guitar or piano ballads, opting for an unusual, but beautiful sound. When you look around the world with eyes that have been opened after many reincarnations and experiences throughout time, your vision becomes increasingly clear and you are able to see things that aren't visible to the naked eye. Studying lhamo gives your music such a rich, unique quality. What originally drew you to it? What is your background with the Tibetan region? I first discovered lhamo after days of hiking alone. I heard a voice so penetrating that I couldn't believe it was coming from a human being. I don't think it was I believe this woman was merely a conduit for an otherworldly force. 'Lhamo' actually translates into something akin to siren or goddess. After asking around I learned of Lhamo, and met the teacher. He agreed to take me on as an apprentice, and I am ever grateful for his kindness and wisdom. You describe your music as "Ghost soul." What does that genre/ term mean to you? Like the man in Tibet, I too am a conduit for otherworldly forces. When I sing, my voice heeds to a greater power. What kind of music did you grow up? Do you come from a musical family? I grew up with many different types of music, but mostly I was fascinated by sound as a child. A stick whipping through space, acorns dropping from trees, fly in my face. Sound calmed me in a way that the visual world did not It moved me beyond a sensory level. Where does the stagename Doe Paoro come from? Doe refers to a deer, and Paoro is an echo goddess, a myth. "When I sing, my voice heeds to a greater power."